Wigan striker Emile Heskey scored his first goal since February to give his side victory over Reading. Heskey, who had earlier headed against the woodwork, latched on to Lee McCulloch's flick and slotted the ball past Royals keeper Marcus Hahnemann. The Latics were well on top and Heskey almost added a second goal when his lob landed on the roof of Reading's net. Reading created few chances but almost snatched a draw late on when Chris Kirkland kept out Leroy Lita's shot. Wigan should have made the points safe long before then but still held on for their first Premiership victory of the season. 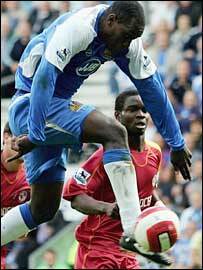 And Heskey, who joined the Latics in a £5.5m summer move from Birmingham, played a pivotal role in his side's success. The former England striker managed only four Premiership goals last season but his partnership with Henri Camara showed promise early on here before the Senegal international limped off on 20 minutes with a hamstring injury. Camara teed up the 28-year-old to fire wide in the fourth minute and was also involved in the build-up to the corner from which Heskey's header rattled the woodwork. It was Wigan who were doing all the attacking, with Reading's only real response being a low shot from Lita which was skidding goalwards before Kirkland pushed it away. And Camara's departure did not alter the fluency of the home side's front play. His replacement David Connolly set up Antonio Valencia to fire in a powerful save that Hahnemann had to push away. Wigan kept coming forward and eventually got their reward in the 38th minute when McCulloch flicked on Denny Landzaat's pass for Heskey to nudge the ball into the net. Another McCulloch flick almost set Connolly free before the break but this time Hahnemann just beat the striker to the ball. Reading remained on the back foot after the break with their only chance of note coming when Ivar Ingimarsson met Nicky Shorey's corner but could not direct his header goalwards. At the other end McCulloch sent a rasping shot flying into the side netting before Heskey wasted a golden chance to wrap things up when he got too much purchase on his lob. Royals boss Steve Coppell sent on wingers John Oster and Stephen Hunt to try and change the direction of the game but for all their attacking effort, the visitors were achieving little. But Wigan were unable to finish them off, with Graham Kavanagh the next culprit - shooting weakly against Hahnemann's legs after running clear. And Reading almost punished them in the dying seconds when Oster found Lita in space only for Kirkland to rush out to block his shot. "Thankfully we have got our first win and that was important, even if it wasn't pretty at times. "We had chances to kill the game off long before the end when we were hanging on. "In the end we were grateful for a great save from Chris Kirkland but we fully justified the three points." "In the first half we looked to be going nowhere and the two sides were cancelling each other out. "We had to respond and tried to play when we could but it was very conjested in the middle. "Their goal was disappointing but we looked capable of getting back into the match, in particular our chance at the end - but it wasn't to be." Wigan: Kirkland, Boyce, Hall, De Zeeuw, Baines, Valencia, Scharner, Landzaat (Kavanagh 78), McCulloch, Camara (Connolly 20), Heskey (Chimbonda 76). Subs Not Used: Pollitt, Jackson. Reading: Hahnemann, Murty, Ingimarsson, Sodje, Shorey, Ki-Hyeon (Hunt 69), Sidwell, Harper (Long 87), Convey (Oster 64), Doyle, Lita. Subs Not Used: Stack, Gunnarsson.